Below script will tell me what item language(s) are present under the current context item and store the result in variable $languageTypes as a Hashtable. Below script will tell me what item template(s) are present under the current context item and store template name and template Id in a variable called $templateTypes as a Hashtable. I’ve added a condition for not to include folder item template Id! We then check whether any of them (templateTypes or languageTypes) are having the count more than one — i.e Are there any items having more than one language versions or are many items with different template underneath current context item? 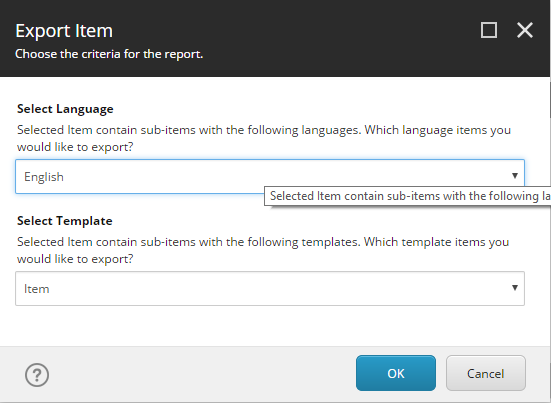 If yes — then we’ll provide a dialog to select the language/template if any. If there are only one language and template items then no need show prompt, just take the value and proceed further. Description = "Choose the criteria for the report." Now based on the data we have following script will fetch items data and provide an option to export data to Excel, CSV, HTML, JSON, and XML. InfoTitle = "Total $($SubItems.Count) items found!" InfoDescription = "Export Item Data"
Show-ListView — Makes life very simple! Note: Make sure you select the appropriate context item in PowerShell before you execute this script. Here I’m adding two additional columns “ItemPath” and “Language” along with the fields. These two columns data will be helpful when we want to import data back to Sitecore. Based on these two columns respected item and language version should get updated when we import the data. Below is the full script — You can execute it in Powershell SPE. How this will be used — Say for example there are many items (with the same template) where Content Author needs to do some updates in bulk and if they do it manually, it will take ample amount of time. So, first of all, using above script –Export Items data into CSV and do required updates/changes and then import data back to Sitecore. In the next post, I’ll show you how we can import CSV data in Sitecore using PowerShell. 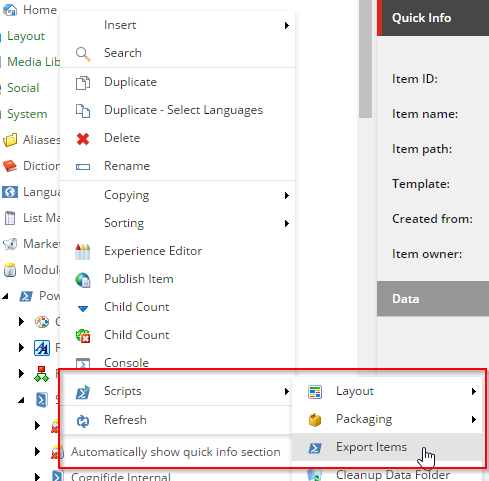 Once you install this module — You’ll get an option to export Sitecore Items in the context menu. Note: I’ve restricted the accessibility for “Export Items” option only to Administrator and for items below the Content Item. You can easily provide the access for this option to any role or specific items by updating the Rule. Have fun with Sitecore PowerShelling! Thanks Ravi for referring an article.